Western spelling Ain Zhalta, AinZhalta, Ayn Zahlta, Ain Zahalta, Ein Zhalta, etc. The name Ain Zahalta is most likely of Phoenician origin and means the eye of the god Zohel. According to Phoenician mythology, the Greek god Zohal (Zohel in Phoenician, Saturn in Roman, and Kronos in Greek Mythology) lost his duel with the Phoenician god Tamiras (Damur) at the source of the river Nabaa al Safa (نبع ألصفا). The river springs from Ain-Zhalta and is also known as the Damur River. Nabaa al Safa, which means pure spring, supplies drinking water to the southwestern towns and villages of Mount Lebanon. The Emir Bashir II tapped this source to supply the Palace of Beiteddine. Others place the Ain Zhalta name in the Syriac language where it means the spring or well that moves. 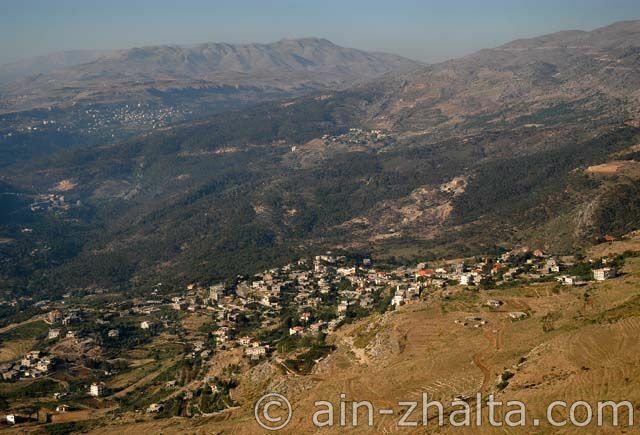 Note that the official name of the village is Ain Zhalta - Nabaa al Safa, keeping in mind that there is no consencus on the spelling of Lebanese words in the Latin alphabet, even at official levels. So don't be surprised to find a word spelled in many different ways. For instance, Nabaa al Safa is also spelled Nabeh Al Safah, Nabeh Safa and Nabaa es Safa. 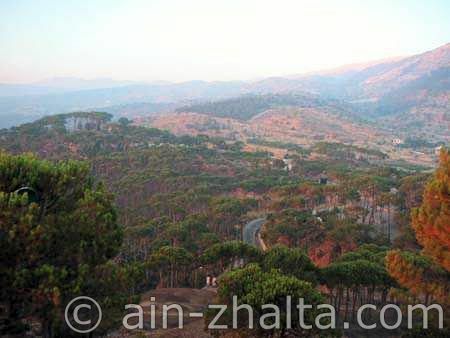 Ain Zhalta is situated east of Beirut in the Chouf district of the Mount Lebanon governorate, at the foot of one of the largest cedar groves in Lebanon. Nabaa al Safa is located 1.3km north of Ain Zhalta. 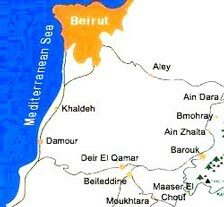 Ain Zhalta can be reached from Beirut through the Beirut-Damascus road (32 Km) or from the city of Damour through the historical villages of Deir el Qamar and Beiteddine (42 Km). 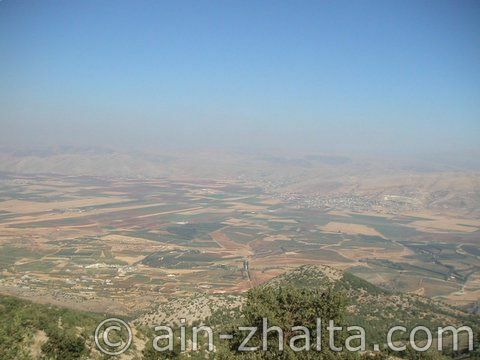 The Ain Zhalta area extends from the western slopes of the Ain Zhalta mountain in the Mount Lebanon governorate to the eastern mountain border of the Beqaa valley governorate. Ain Zhalta is perched at 1,200 meters near the mediterranean coast. Consequently, it enjoys hot dry summers during which its population swells by 25% to accommodate seasonal residents escaping the humidity of coastal cities such as Beirut. During the winter, the weather is both humid and cold with occasional snow. "Good" weather runs from April to October. The four season are fairly typical with temperatures ranging from 5°C to 25°C. Lebanon is a tiny country (10,452km²) roughly the size of San Diego county, CA, USA. There are no deserts in Lebanon. The country consists of a coastal strip, and a fertile valley separating two mountain ranges peaking at 3,083 meters over the rest of the eastern Mediterranean shore. This makes it possible to swim in the sea and ski in the mountains on a same day. This also enables Beirut residents to spend the summer in mountain villages without disrupting their work in the capital. 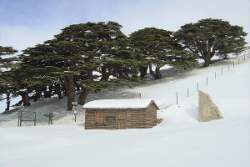 The Cedar forest of Ain Zhalta is a part of the Ain Zhalta - Barrouk - Ma'ser Eshouf Cedar conservatory, which covers about 5% of the country and is home to about 2 million cedar trees. Ain Zhalta is blessed with an abundance of pine trees. The Stone (Umbrella) pine forest sill the hills surrounding the village. Pine nuts is a substantial cash crop for the village. The much sought after pine nuts from that area are sold at top price. Rich in vitamin D, pine nuts from the Lebanese mountains are well known for their high concentration of monounsaturated fat which promotes a healthier cardiovascular system. 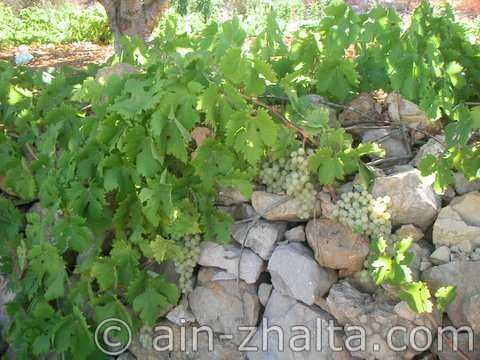 Ain Zhalta farmers grow apples, peaches, olives, figs, quince, grapes, apricots, almonds, pomegranates, persimmons. Phoenicians inhabited Lebanon and Syria between 1500 and 300 BC. Phoenician sailors were the master sea-traders of the ancient Mediterranean, and built the most advanced naval vessels of their time. The travelling tradition never stopped as many Lebanese continue to emigrate and spread around the world. For instance, there are 4 million Lebanese in Lebanon, and 9 million in Brazil! Many Lebanese reside in North America, Western Europe and Western Africa as well.